The Long Quiche Goodbye comes out in twelve weeks! I don’t have a ticker counter, something that will tick off the minutes and hours and help me countdown to liftoff, but twelve weeks feels important. It’s the length of a season. To every season, turn, turn, turn…[the page]. To honor this twelve-week mark, I’ve posted a book trailer on YouTube. Click this link to VIEW TRAILER. I hope you'll take a look at this "tasty morsel" and share with friends. [If you click this link and leave a comment on my website, you'll be entered to win my next newsletter contest.] If you want to pre-order, there's a link on my website for that, as well. In the meantime, I mention The Long Quiche Goodbye because in the story, Charlotte, the owner of The Cheese Shop, has twin eight-year-old nieces and they are the inspiration for this week's recipe. Long story short, Charlotte's cousin Matthew needed someplace to stay, so he and the nieces moved in with Charlotte. Charlotte adores the girls and wants to make sure they start off each day with a healthy dose of love and a good meal. Feeding them something they like to eat helps! Their favorite breakfast includes eggs and Zircles or Crisp Toasts. I've shared my Parmigiano Zircles recipe before on this blog, but not Crisp Toasts. What I love about these little gems is how versatile they are and how easy they are to prepare. They go with breakfast, lunch, dinner, salads, soups, or are tasty all on their own! And you are the visionary. You get to decide which spice and how much of each spice goes into them. You'll need a baguette of bread, oil, balsamic vinegar, spices, salt and pepper. For this batch, I sliced the baguette of bread thin. I set the slices on a cookie tray, then I brushed each piece with olive oil and balsamic vinegar. I seasoned with the twins' favorite spices: rosemary, thyme, salt, pepper. Then I sprinkled with a generous amount of grated Parmigiano-Regiano. [You can also use shredded Parmesan]. Slide the cookie tray into a preheated 400 degree oven. Bake 6-10 minutes, depending on your desire of crispiness. Remove from oven and serve immediately with your favorite meal. They are crunch-in-your-mouth yummy. The first book in Riley's Memphis Barbeque series, Delicious and Suspicious, will be released July 6. [The same date as mine!] Though I'll be having a contest in June to celebrate, Riley is choosing NOW! Don't miss out!!! “Contest” in the subject line. Really, really want to up your chances? You’ll get one extra entry if you follow us on Twitter, one extra if you subscribe to our posts (in the right hand sidebar under “Subscribe”), and one extra for becoming a follower (by clicking the “follow” button in the right hand column under our book covers and blog roll.) Just send us an extra email at MysteryLoversKitchen@gmail.com and let us know what you’ve signed up for. If you’re already a follower or subscriber, let us know that, too! Last but not least, my next newsletter is coming out this week. Sign up to receive it by clicking this link: Avery's newsletter , read about my Cheese of the Month, and get a heads-up on future contests. Avery, I have been on a big bread kick lately and this is definitely going on my list of things to have when I need a tasty morsel! Juju, you'll love The Long Quiche Goodbye! And I want some of those Zircles for lunch. The mere thought is making me hungry! These look wonderful and I'm eager to try them. To be perfectly honest, I'm even more eager to try The Long Quiche Goodbye. Love your trailer. Gorgeous! Congrats and enjoy these exciting 12 weeks. Great recipe! Can't wait to try it. My own protag doesn't spend time in the kitchen, but her hunky dude owns a chain of Cajun Delights restaurants. Much better! 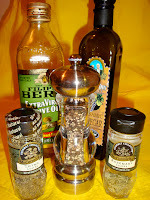 Come learn a simple dressing recipe and win Cajun food or a book tomorrow at http://www.poweredbybooks.blogspot.com. I can't wait for your book, Avery! I checked out the trailer and loved it. And your crisp toasts looks delicious. And the toast looks amazing! Yum! Looks tasty, easy, and great for guests. Looking forward to reading The Long Quiche Goodbye. LOL! Dave's right, the title is hilarious! Love the crispy toasts. Yum! Fun trailer, too. Thanks, "Year on", Cleo, Cricket, and everyone. I'm so glad everyone is enjoying the title of the book. It sure is fun coming up with titles.